It’s a great day for transportation in the Bay Area. At San Francisco International Airport this evening, a large group of Bay Area taxi drivers has decided to make picking passengers up nearly impossible in an effort to protest the airport’s recent decision to allow ride-sharing companies to operate on its premises. But according to reports on Twitter, the protest has not only limited the use of alternative ride-hailing apps at SFO, but it has caused gridlock for anyone trying to get in or out of the airport’s terminals. Since the California Public Utilities Commission created a legal framework for ride-sharing companies in the state, there has been a precipitous drop in cab rides, due in part to lower prices from new upstart competitors. The situation has gotten so bad that the head of the local taxi industry warned it might not continue to exist in 18 months. One safe haven for cabbies was SFO, which for the past few years has held strong against the inevitable march of progress. After receiving cease and desist notices for operating at SFO without permits, however, Uber, Lyft, and Sidecar all recently worked out deals that would enable them to legally pick up and drop off passengers at the airport. In doing so, SFO became one of the first airports in the country to embrace ride-sharing services at its terminals. But that decision isn’t sitting well with local taxi drivers, who have already seen those services steal away customers in San Francisco and the surrounding areas. Tonight those cabbies made their discontent known by clogging multiple lanes of the airport drive. 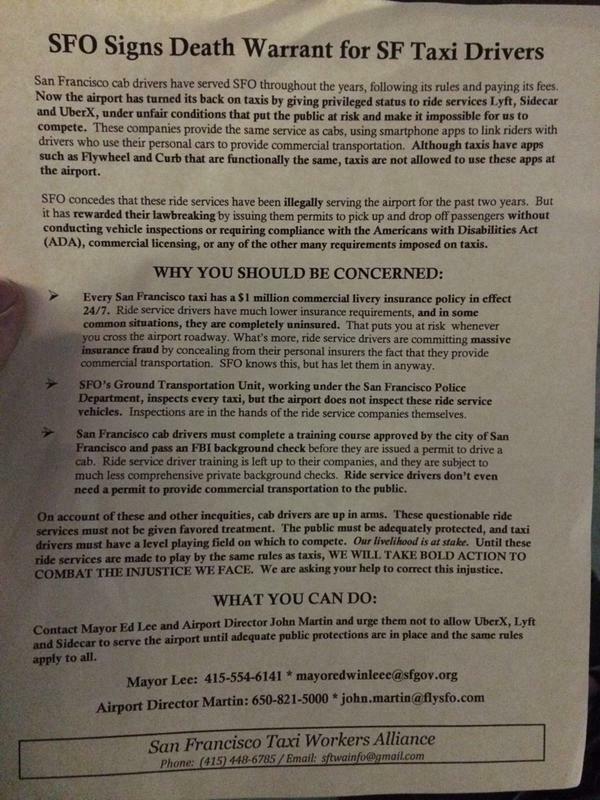 They also handed out flyers warning that by issuing permits to Uber, Lyft, and Sidecar, SFO has effectively signed a death warrant for the local cab industry. Flyers contained the usual FUD that the cab industry has taken to spewing about ride-sharing companies — that their drivers are unlicensed, that their cars are uninspected, that they are unsafe and unreliable. At this point it seems unlikely that the action will cause SFO to reverse its decision to issue permits to ride-sharing companies. But who doesn’t like a good protest?